Godin, Dean, Seagull, Aria, Schecter,Dean,Godin, BC Rich, Epiphone, Spector, Fender,Gibson,Vintage, etc. emphasize that we don't sell a “stock” guitar that’s straight out of box, like just about every other music store sells. All our guitars are shop customized by us to play considerably better than similar looking instruments. Still, some folks think it’s voodoo or marketing hype. So instead, we’ve chosen to show you (in condensed form) the kind of labour intensive & time consuming custom work we build-in to guitars sold by us,exclusively in our own shop. The end result is a guitar that will outplay the same or higher priced versions found elsewhere. ask us-we would be happy to elaborate! Then,play them and see what a properly playing guitar performs like. Here’s a typical import (insert your favorite brand name here) that’s NOT going on the rack till it’s been shop customized to play like a dream. We do these day in, day out. Over the past 30+ years we’ve picked up on what each brand model’s quirks are. We know what needs to be done to bring these guitars and basses up to a greatly improved level of performance & reliability, often surpassing much higher priced “stock” counterparts from other stores. This is especially apparent when comparing instruments from the bigbox discount dudes (or is that duds?) . interference from entering the guitar’s electronics (and sneaking into your amp) and generally being a pain to deal with. Other stores prefer to sell their guitars unshielded probably because they assume buyers won't notice what they can’t see, so why should they bother? 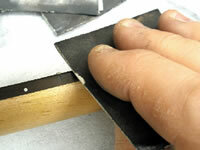 Here we’ve started the painstaking process of custom cutting and meticulous installation of Lo-Z shielding foil. 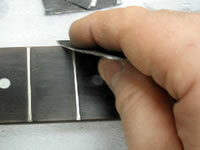 This foil is inlaid by hand , along the cavity bottom and walls. All layers are interleaved to make a continuous connection. Additional tabs are inserted along the top edge since these will also make contact with “matching” shielding foil that’s applied to the under-side of the pickguard. The entire shielded cavity will now form a metallized “cage” that will keep the controls and switching from picking up any interference by draining this interference to the shielding. This completed “cage” in turn, is grounded to a common ground from the guitar & amp. This shielding is done to every new guitar only purchased from our store, before it’s put up on the store's display rack for sale. Here’s another view of the body’s pickup cavity. The bare wood section that’s left “stock” by most other stores also gets shielded by us. 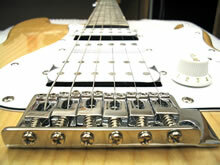 This helps to reduce interference & noise that sneaks in, thru the pickups themselves. We prefer to NOT use copper or brass foil for shielding, since in our experience, they’ve both proven to corrode over time and erratically change their own shielding characteristics. By extensively shielding our guitars, players are repeatedly noticing that our guitars tend to be less prone to noise, especially when plugged into today’s modern hi-gain maxed out amps and fx pedals. (usually in the middle of The Great Solo!). Take a close look at the jack connectors in the lower left. The “stock” one(far left) rarely has any kind of a washer, to keep the jack from spinning loose (from repeatedly plugging & unplugging). On the odd occasion they do have a “washer” it’s usually a cheesy phenolic fiber washer (no gripping benefit here , folks). We remove these sub-par PITA jacks and toss ‘em into Le Garbahge. In order to retrofit our new improved input jack, we have to “undercut” the input cavity to accommodate the new jack’s sturdier design.The middle photo shows just that. By using our trusty Dremel mini-router, we trim out just enough wood for proper operation of the better quality jack. We then solder in a MUCH better manufactured and reliable Neutrik jack (right of the third picture) featuring thicker guage metal and a spring metal positive contact that “grips” the live pin on the guitar cable’s plug making a greatly improved & reliable connection (look Ma-no wobbles, no crackles!). We also install a heavy guage (real) metal toothed washer to ensure the jack stays put, in it’s mounting plate. Yes, we do this to all our guitars & basses (even, the lower priced ones as well).It’s the little things too, that add up to make a better playing instrument. 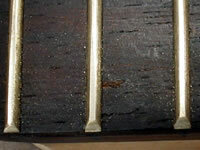 Here’s a “before & after” view of another str*tocaster type guitar’s control cavity. In the left photo, this is typically what you get from just about every manufacturer and it remains that way (raw and UNSHIELDED) even after you buy it from just about every other music store. In the photo on the left, is what you get with one of our shop customized guitars, purchased from us. The control cavity gets fully shielded in our own shop. As well, we rewire the control assembly to eliminate groundloop wires, installed (incorrectly) from the factory. In the pics on the left, you see a typical L&s P@ul style control cavity. Again, stock from the factory and how you “normally” get it from any other store, unshielded. The second photo on the left, after we’ve shielded the entire cavity as well as the cavity’s cover plate. 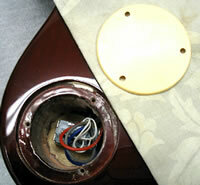 The lower pix show the pickup switch cavity (unshielded from the factory) and afterwards, shielded by us . This labor intensive (and time consuming) customizing on all guitars we sell pays off by giving players a quieter operating instrument , that’s less prone to all those irritating outside world noises trying to hitch a ride on to your guitar’s signal. 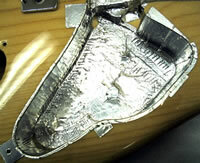 It’s important to note that we do the same custom shielding & setup work on not just the more expensive models but also on all of our more affordably priced guitars and basses as well. We also take the time to "correct" the wiring on all Gibson & Gibson(four control)type electric guitars control setup.Hard to believe ,yes,but they're wired incorrectly,fromthe factory,since the dawn of time.Even "copy"manufacturers duplicate the same mistake! How do you know one from the other? Simple. Set your pickup switch in the middle position.Make sure all four controls are turned up.Now,turn one volume control down to zero.If the guitar goes dead,it's wired incorrectly.This doesn't allow for blending between both pickups properly. "dead" if you turn either volume control down to zero. 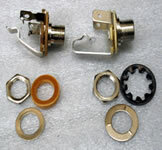 has no effect till it's almost fully turned down ,basically acting less like a control and more like a switch.We correct the taper on these so you actually get a more gradual,tapered roll off of the higher frequencies as you rotate the control's knob.This upgrade on our guitars give you more tonal possibilities. After the guitar’s shielded, we do several checks to confirm throughout the cavity to ensure a good & proper ground will be consistently available. Can’t get much better than .004ohms(!) At this point,we also can confirm any ground loops throughout the circuit that could cause any other "odd" hum noise from appearing down the line. 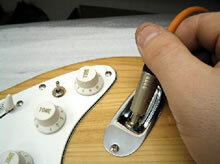 Step #10 "Installing loudness compensation"
On many factory shipped guitars, when you lower their volume controls, the guitar’s sound becomes muddy. On these we install loudness compensation components, (shown above) onto the volume controls. Component values are determined for each individual instrument to restore the guitars characteristic tone at all volumes and clean it up when the volume is turned down. Step #11 "Voicing the tone controls"
In the first picture, you see the typical green or orange “chiclet” type tone capacitors (aka caps) soldered onto most guitars tone controls. Unfortunately, most of these tone controls are virtually useless, because they use cap values that’re a holdover from the old days. This basically gives you, the player, a choice of NO tone at one end of the control’s rotation or pretty much muddy tone at the other end. We ditch these tone caps and assemble our own “composite” cap (shown in the pix, protected by heat shrink) that’s tweaked by ear, to respond with that particular guitars pickups, offering you a much more usable tone and response from the tone control. 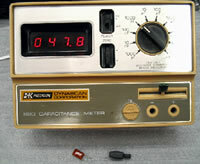 We use a BK digital capacitance meter (shown here reading a stock cap) to measure the final cap values of our composite caps so we can duplicate these for more of the same models. Players who use our tone control enhanced guitars appreciate the wider range they now get, from a moody jazz tone in an amp’s clean mode as well as a that pinched back tone with the amp’s overdrive on(cool for the ZZ top or Schenker stuff). Step #12 "Adding bridge tone control mod"
On Str@t style models, we re-wire the last tone control so you now have tone control on the bridge pickup (where it’s needed the most) On stock, factory equipped guitars, there’s usually NO tone control on the bridge pickup, something that was always lacking on most $TRAT based guitar designs(another holdover from the old days). On this model, this final version, shop customized by us, offers the player FIFTEEN, usable tones. More versatility from one instrument means more value for your investment and more tones! We now can start doing the fretwork. This labor intensive, time consuming job involves quite a bit of skill and experience (over 30years in our shop) to perform consistently, reliable, professional results. In pretty much all but a very few expensive guitars, some type or degree of fretwork has to be done to a “stock” guitar. Fretwork has to be performed to correct for “irregularities” (notes buzzing out, choking off, high string height, high/low spots, flattopped frets, etc) We start by making sure the neck is dead straight (for reference) and then we black off (sometimes called blue-ing in the machinist’s world) the frets. .This will allow us to spot any “oddities” across the fretboard that’ll need correcting as we move along in the process. 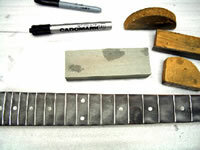 Step #14 "Levelling the frets"
We go over the frets in several successive passes, using several different grits of grinding stones, abrasive papers and fret files ,made in our own shop for each specific purpose. before it gets cleaned off the fingerboard. 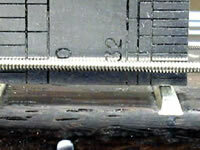 Take a closer look at the frets in these pix. After an initial pass with a levelling stone, you can see more accurately what you typically get in a factory stock guitar. 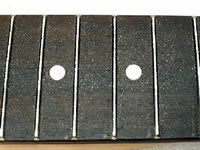 The remaining black marks along the fret edges indicate where some of the low spots are.These low spots would make the string buzz at the next,higher fret . The squarish / flat top looking sections indicate high spots. It’s interesting to note that this is typically how the frets are left (without the black marks & dust of course) on just about any given guitar that hits the shelves these days. Here’s another pass as the frets start to gradually take on a more uniform shape. 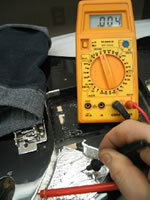 The “trick” is to know when to stop (since you can’t put metal back onto the frets!). This is where experience counts. come out of the box with "flat tops" and corroded,to boot! Step #17 "Rounding over frets & profiling fret ends"
Now that we have consistently flat topped frets, across the entire fingerboard, we now “profile” all the fret edges to eliminate these flat tops. Using specially ground 3-point & horse shoe files, we take down the square edges left from the previous fret leveling procedure to obtain roundover frets (referred to as school bus style since they look like the roof of a school bus). 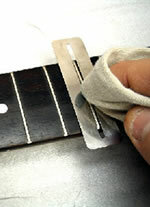 By blue-ing the frets, we can easily tell how much metal is being taken off with each pass of the file. 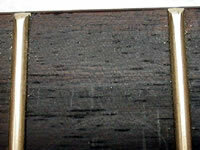 This style of finishing frets yields a fretboard with MUCH less buzz and allows a lower action (string height) and greatly improved , effortless playability, compared to fretwork left flat & square on factory “stock” instruments. 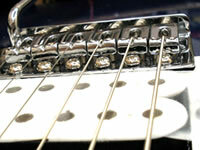 These photos show the fret ends being rounded over for a truly professional feel. 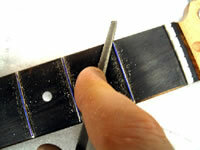 In these pix, we contour the fretboard edge by rounding over the stock “sharp” edged neck profile. This seemingly small, yet overlooked step in most factory guitars, gives our guitars that well worn, comfortable, played in, “old guitar feel” that’s enjoyed by so many guitarists. In this process, we also grind down those nasty frets “tangs” that feel jagged when you run your hands across the neck on other guitars. All you feel is a great playing, silky smooth neck that plays like butter. 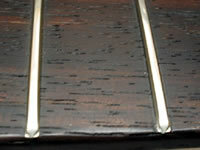 In the first two pix, you can see the frets starting to take on a more rounded over profile after taking the edges down. This process allows a lower string height (a.k.a. action) with less string to fret buzz as well as smoother string bending without "dead notes". In these two pix, you’ll notice the frets ends starting to look more rounded over as well as this reduces feeling any jagged fret endsin the palm of your hand as you play across the fingerboard. This also gives the player the same feeling normally only available from much more expensive or nice old, & well played,professionalquality instruments.This is why you hear veteran players often making the comment about any given guitar as "does it play like an OLD ONE?" The first pic shows the beginning of the next process, where the frets go thru several passes with progressively finer grits of abrasive paper to gradually reduce any file marks left over from using the coarser files. After we finish with abrasive papers, we buff down the frets with even finer #0000 steel wool to further reduce any scratches or dullness left from the paper process. 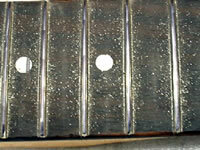 Using steel wool also helps to level out and smooth the fingerboard to obtain a silky feeling neck. 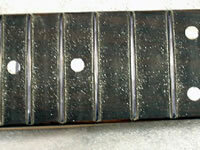 In this pic, we give the rosewood fingerboard a thin coat of lemon oil and allow it to sink in. 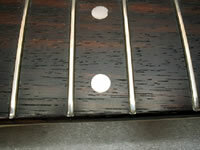 This coat of oil initially cleans off any residue left from the fret work process. 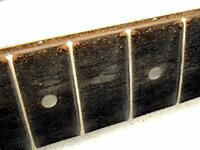 It also helps protect the fingerboard from drying out during the dry, low humidity,cold winter climate. On a maple fingerboard, a coat of hardwax is applied to the neck and buffed. The last pic shows the final, lengthy process where each fret is individually hand polished to a mirror like, slick finish with a fine metal polish. Every guitar we sell goes thru this same extensive custom shop setup to outplay even many higher priced “stock” guitars sold elsewhere. Step #21 "Cutting the nut slots"
This next step in the custom shop setup involves re-cutting the string’s slots (also referred to as setting the action at the nut) in order to lower the string’s height relative to the fingerboard. 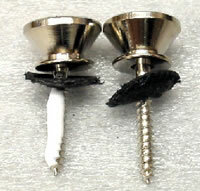 This also helps to reduce the string tension and finger pressure needed to play even the simplest chords. ”Stock” guitars (like the ones sold straight-from-a box and found hanging on the average bigbox mega-discount music store’s walls) are regularly shipped from the factory to the dealer with high action, simply because it’s easier (=cheaper) for them to sell it this way. This critical part of the setup involves a little finesse and experience to get it “just right” We check the gap between the first fret and the strings by using a feeler guage as a quick reference. By using a set of nut slot files of varying thickness, the final string height is determined by touch. The manufacturer just doesn’t have the time to do this important procedure (as well as the other ones we’ve shown so far). When you take into consideration the sheer quantity (and prices) of guitars they’re building & shipping out, they can’t afford to cover the additional cost & time to do this. The manufacturer “assumes” the dealer will take care of it. The average dealer (who’s trying to keep price margins tight in order to remain pseudo-competitive) can’t afford to spend any “extra” to set up the guitar. The end result is, guitars that will virtually discourage any player from wanting to play any guitar. A quick way to check if any particular guitar has (too) high action is simply, clamp on a capo at the first fret position. If that guitar suddenly feels GREAT to play than without the capo, then that’s a pretty good clue it needs some work. 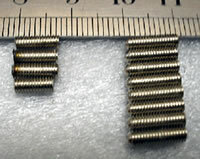 The bridge saddle screws in the right of the pix are stock ones. Unfortunately, they’re way too long. Assuming you lower the bridge saddles to lessen the string height, the “excess” screw treads end up poking you in the wrist. We shorten these screws (like the ones on the left of the pic) so they’re graduated in length & they match the saddle’s string height, without poking your wrist. Here’s a view of a typical truss rod found lurking under the fretboard and how it’s fitted into a channel routed into the neck. 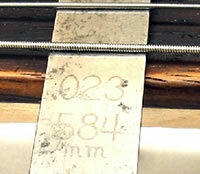 The truss rod’s primary job is to counteract the tension applied to the neck by the “pull” of the strings. Contrary to the “myth”, a properly setup guitar’s neck actually does have a “little” bit of warp. 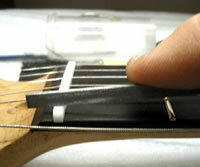 Since strings vibrate with an “arc”, this allows the vibrating strings to slightly stay clear of the fretboard. In our demo neck above, you can see the (blue) truss rod shown with a forward bow. This would make the strings buzz mainly at the centre of the neck. In the neck below it, the truss rod is shown with a reverse bow. This would make the guitar tough on the fingers to play. It would also thorw the guitar’s intonation off since you’d now be “stretching” the strings further down, pulling them out tune with themselves in the process. After we’ve installed new strings during the shop setup, we re-adjust the truss rod for the proper amount of “warp” (aka relief) depending on the string gauge and the climate for that season. We normally advise folks that purchase guitars from us to have their guitars truss rod checked and adjusted (if needed) at least twice a year (no charge) to compensate for the climate’s effect on the guitar due to humidity changes. Step #23 "Setting the intonation"
At this level, is where any player would notice the difference between a guitar that’s raw/off the rack/stock/straight of the box and one that’s been shop customized and professionally set up to play like it’s supposed to. If the fret work hasn’t been done (or done properly), lowering the bridge saddles won’t help (not much anyway) and/or filing down the nut slots only affect the action for the first five frets (open chord positions). It becomes a “sum of all parts” situation, where ALL steps in the process have to be done properly to enjoy the benefits of superb playability. After our custom shop fretwork, we can set up our guitars to have an action height that meets (or beats!) 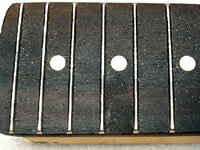 3/32” of an inch, typically measured at the 14th fret. This is considerably better than factory spec’d, even on much higher priced, one of a kind, custom built instruments. The photo on the left shows this measurement. You can try sliding two dimes between the frets and the Lo E and Hi E strings ,around the 14th fret area like in the photo on the left. This will give you a quick way to check a rack full of guitars to see which ones will likely need some kind of setup work. After the string height (the action) has been properly adjusted so the guitar plays effortlessly, it’s now time to adjust the intonation. How well the intonation is adjusted will determine how accurately the guitar will sound “in-tune” as as whole, across the entire fingerboard (not just at the first couple of frets) This will allow the guitar to sound more “balanced” between playing open chords nearest the nut and barre chords further up the fretboard with a minimum of hassle. The intonation is adjusted by individually varying each string’s length, by turning the bridge saddle screws & checking each string’s pitch with an electronic tuner. After the action & intonation have been settled, pickup height is adjusted for proper string to string balance. Even strap pins are glued into their screw holes to secure them & help prevent them from letting go when you least expect it (a common complaint on way too many guitars). Plug your cable into one of our shop customized guitars and you’ll feel a definite “CLICK” telling you your cable won’t be crackling and slithering out of the guitar like on many other stock versions. When all is done to satisfaction, all our guitars get cleaned of "prints” and buffed with a wipe of Meguire’s YellowWax to protect the finish till it ends up in the hands of the next “Pete Townshend” ! !